Woodstock was an accident for me, one of those great accidents that happen once in a lifetime and you never forget. Until Friday evening August 15th, 1969 I had never heard of Woodstock and I don’t think most of the other guys I hung out with in the Bunker Hill section of Waterbury CT had either. One of them came up to the local park where we usually met up on Friday nights and said “Who wants to go to Woodstock?” It was about 5pm. I think he had found out about it from some friends at The Taft School where he attended and once he told us what it was about five of us said we wanted to go. We all piled into his old Ford Galaxy 500, one of those big old cars that fit six pretty comfortably and after making some runs home to get for some extra cash and jackets we took off. It was Dave driving, Paul and Hank in the front seat and Mike, Danny, and I in the back. I think we all thought it would be one of those deals where we would drive over to New York state, spend three or four hours listening to the bands and drive the 2 ½ hours back home in the early hours of Saturday. That’s what I thought. Well, we managed to get there with about a gazillion other people and there was no getting out. We got close enough to the site that we could walk to it from where the car was and spent the next three days experiencing the greatest music event of all time. Wow! We took turns going back to the car to get some sleep throughout the weekend. The Galaxy had bench seats so with one in front and one in back two could get some sleep at the same time. I know we were probably hungry, tired, and wet just like everybody else there but all I remember is the great music, the thousands and thousands of kids who were all cool and got along, and how wonderful it was to be a twenty year old guy having the time of my life. As we were leaving I grabbed a muddy old wool army blanket out of the mud. 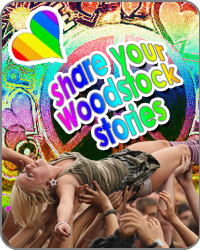 Time passed, I got married and started a family and lost touch with all those guys I went to Woodstock with. I haven’t forgotten them or the great time we had at Woodstock though. I think of that experience often and fondly. I had always been nostalgic about that time and finally on August 15th, 2003 I took a ride back there. Ran into Duke Devlin near the Woodstock Monument and had him snap a picture of me. I STILL HAVE THAT BLANKET. It’s my one physical connection with that time and that place!